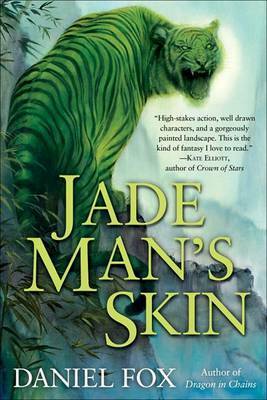 In this soaring epic, Daniel Fox weaves the ancient myths and legends of feudal China into a fantasy world of brutal war and brittle passion, immortal gods and mystical creatures. With the long-chained dragon now free and the rebels' invasion smashed by her exultant fury, the balance of power has changed. Young emperor Chien Hua is no longer struggling for survival; now he is ambitious to strike back. As treacherous General Ping Wen whispers in the emperor's ear, not even Chien Hua's beloved concubine or his most trusted bodyguard can reason with him. Worse, prolonged exposure to magical jade is changing him radically: His increasingly godlike powers are making him dangerously rash. But with the dragon patrolling the skies above and the strait beneath, the emperor's forces have no hope of launching a counterattack--until a goddess moves to interfere. Yet neither the clash of armies nor the opposing wills of goddess and dragon can decide ultimate victory or defeat. The fate of the war lies in the blood-deep bonds between the dragon and the boy Han, her jailer and her liberator--and in the prices both will pay for their freedom. Daniel Fox is a British writer who first went to Taiwan at the millennium and became obsessed, to the point of learning Mandarin and writing about the country in three different genres. Before this he had published a couple of dozen books and many hundreds of short stories, under a clutch of other names. He has also written poetry and plays. Some of this work has won awards.